Home Security System has many features, one of them being an alarm but all the other advanced features make it more than just an alarm. It’s nothing less than an advanced and updated aspect of modern technology. Long gone are the days when alarms were used as the only means of home protection but home security systems have completely changed the game. It doesn’t only keep homes safe but it also makes lives better, comfortable, efficient, and hassle-free and adds soul to your beloved home. Modern time is all about making things easier and fast. Home security system gives you just that. It allows you to keep your entertainment devices updated. You can record live videos, pause videos and movies, schedule shows according to your preference, you can simply turn your house into a theatre with just a push of a button. Affordability of such security devices has made them a common commodity in every house. Security devices are no longer just a fictitious factor seen in movies. They are easily accessible and understandable by the common people. At times you even get free installation and free equipment by the selected security company, making things easier. Cameras are connected to a central monitoring system that keeps things around your house in check. You can experience live video surveillance either on your smartphones or tablets, simply by downloading the following application that can be synchronized by the data of the main control panel of your home security device. Imagine how convenient and comfortable your life would be if you didn’t have to get from your cozy and comfortable armchair or bed to shut the drapes or answer the door, or even to turn on/off the air condition. You can perform all these acts within your comfort zone at complete ease. 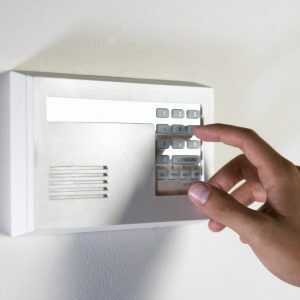 Remember to keep yourself under complete and thorough knowledge of how a home security system is operated. Never give out your passcodes to anyone.